Telegraph station at Barnstaple, 11 miles. The Clarence, situated at the higher end – and the Britannia and Packet Hotels, at the lower end of the town. There is a boarding house on the quay, and excellent private lodgings in every part of the town. Saturday, for meat and poultry, eggs, and vegetables. One in April, the other in August. Branch of the National Provincial Bank, and also of the Devon and Exeter Savings Bank. 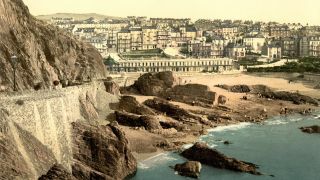 Ilfracombe is a considerable sea port town, and now a fashionable watering place, on the north coast of Devon, near the mouth of the Bristol Channel. The harbour is considered the safest and most convenient along the whole coast. It is formed like a natural basin, and is almost surrounded by craggy heights that are overspread with foliage. The town is built partly at the bottom of a steep declivity, and partly up the side of it. New buildings and streets have been built, to afford accommodation to visitors. The terraces and public rooms, forming the centre of Coronation Terrace, have been constructed — the hot and cold baths at Crewkhorne have been formed, and a number of new houses erected on the eastern side, commanding an extensive prospect over the town and Bristol Channel to the Welsh coast. Baths. – The direct way to Crewkhorne is by North-field to the baths, and through the tunnel. Walks and Rides. – The walks in this neighbourhood are very beautiful, and afford delightful excursions and views. Lynton and Lynmouth. – The scenery in the neighbourhood of these two places is “wild and beautiful – magnificent and lovely” to use the words of a handbook of Devon — the writer of which observes that it is quite beyond his powers to attempt a description of the scenery abounding in this fascinating neighbourhood. The accommodations for visitors are pretty nearly equal in each. Lynton Hotels. – The Valley of the Rocks Hotel; the Castlo Hotel; and Crown Inn. Lynmouth. – An excellent inn called the Lyndale Hotel. There are in both places lodging houses innumerable. The tourist should proceed to the far-famed Valley of the Rocks on foot, along the Cliff Walk, whence the scenery is very fine. The view in the valley is exceedingly grand. The East and West Lyn Valleys are very beautiful also; but the tourist should employ a guide to accompany him on his first visit to these and other principal points of attraction in this picturesque neighbourhood.